A Level students at Uxbridge College celebrated some excellent individual successes on Thursday, August 16th along with great results across the board. 98% of the students achieved A* – E grades, placing the college in line with national figures and heralding another year of expected Value Added success on Department for Education tables which will be published in January 2019. This records a measure of the progress that students have made compared to their GCSE grades. As well as students who may have achieved good grades at school, Uxbridge College also welcomes those who may not have fulfilled their potential, or need extra support with language skills. Many of these students, however, go on to demonstrate significant improvements. The college has a strong track record of students with lower GCSE grades making progress above the national rate, achieving excellent A Level results and then being able to enter the university of their choice. Marcus Davenport, 22, from Uxbridge made exceptional progress. He started on a Foundation Studies course and finally achieved A*, A and B grades. Marcus, who has a learning disability and received extra support, is now off to Brunel University to study History and Politics. He also excelled in college activities such as the Reading Ahead scheme, debating competition and MP’s Questions and Answers. Navleen Mutti, 18, from Hayes will be studying Economics at the University of Surrey after also achieving A*, A and B grades. Nadeem Moledina, 20, from Pinner was another student to achieve A*, A and B grades and will be studying Physics and Philosophy at Nottingham University. For grades A*-C this year, which is the first in which the students all completed their courses on the new linear system – which means that all exams are sat at the end of the second year, rather than being carried over from the AS Level year – the figure was 74%. Darell DeSouza, Vice Principal Curriculum and Standards, said: Congratulations to all our achievers; we are extremely proud of them all, particularly considering how far many have travelled from their starting point when they arrived at the college. In addition, a number of our A Level achievers at Uxbridge College, which is the best West London college for 16 – 18 year old performance overall, also completed their GCSEs at college, either for the first time or after taking their exams at school. These very positive results also bode well for next year’s Value Added scores which this year saw Uxbridge College coming 4th. nationally out of all Further Education and Sixth Form Colleges and becoming the best London College for institutions offering a full A Level programme. Other top achievers included Abin Rai with two A* and an A, Ovidiu Tirnovan with an A* and two A grades and Fozia Patel with three A grades. 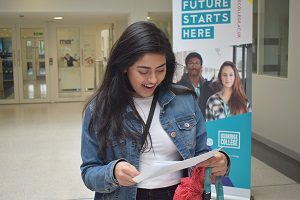 These results should encourage local young people to seriously consider enrolling at Uxbridge College to study for their A Levels in a new and challenging environment.